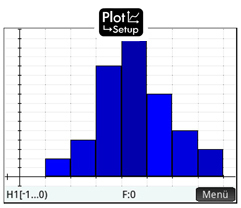 With the application of the univariate descriptive statistics (1Var app) statistical data can be suitably prepared graphically in a simple way or characterized by statistical figures. 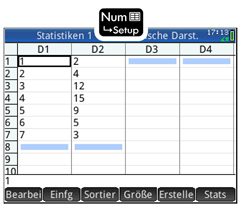 In the Num -view statistical information will be entered into the column D1. 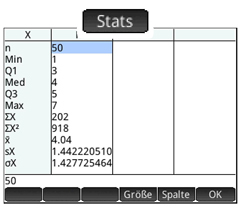 As seen in the above example, the characteristic values ​​in the column D1 and the associated frequencies can alternatively be entered in the column D2.